All the cool kids these days are dreaming about owning a Tesla, but no car enthusiast would frown over a scorching hot red Ferrari. Throughout the years, the red Ferrari has become a symbol of speed and luxury, and while only select few can afford one, nearly everyone can afford to spend $40 on a stylish case for their phone. 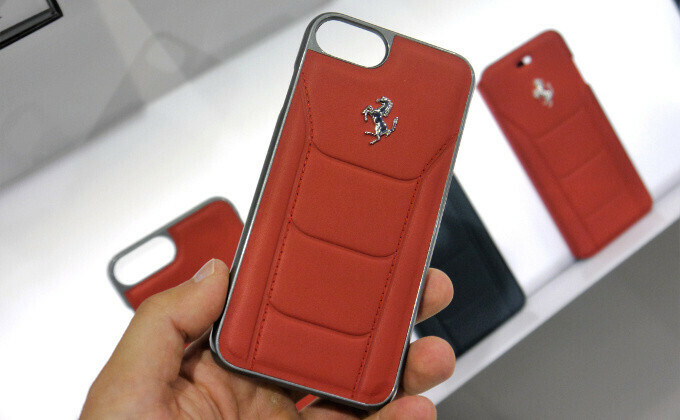 Ferrari is glad to sell you one: with that signature red color and the beautiful company logo front and center, the Ferrari iPhone case looks stylish and is actually well made. You can get a red Ferrari for $40. A case that is. And for those of you fans of German car engineering, there is also a Mercedes-inspired one with a similar leather finish, but featuring those signature for Mercedes colors. Munich-based BMW also has a special treat for its fans with a sleeker case with the large BMW letters etched prominently on the case. And while there were a ton of cases at IFA 2016, these ones definitely catch the eye. Take a look yourself. That's a fancy case, yo! But a little steep in pricing... Well that's probably due to the Ferrari brand.